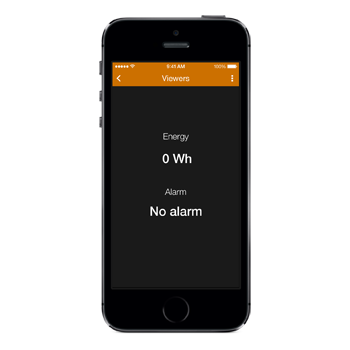 With HouseinHand KNX you will be able to control very easily your home or office lights whether they are simple or adjustable. Besides, you will be able to see the light status in real time. You can do all these things inside or outside your home. 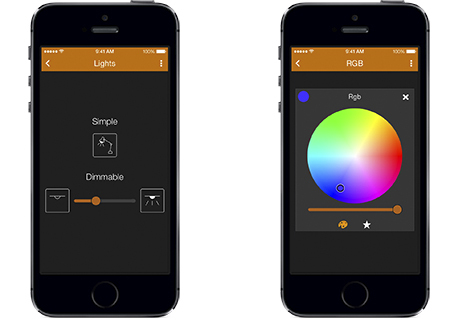 HouseinHand KNX also allows you to control the RGB color lights. In order to change the color, you have to move your finger through the palette and then slide the finger in the lower slider. The palette chooses the color, and the slider adjusts the brightness. 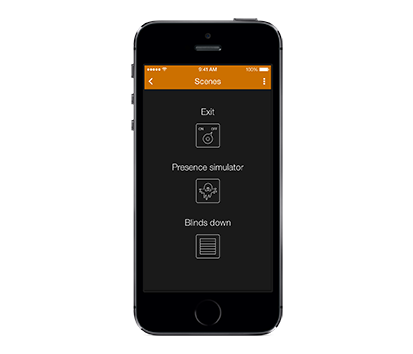 With HouseinHand KNX you can also control the blinds in your house very comfortably. Lifting up or down, or stop it. One blind, just a group or all of them. Almost closed, right in the middle or completely lifted up. The possibilities are endless. 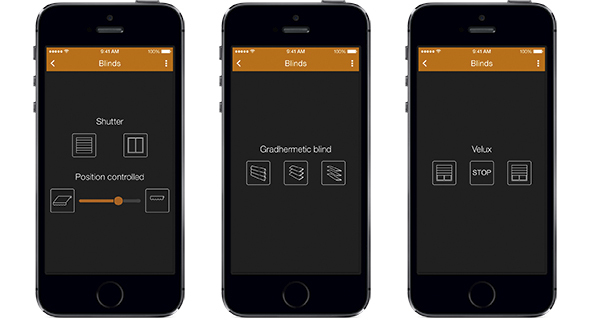 In a lot of houses, besides KNX traditional blinds, you can also have Gradhermetic blinds. This type of blinds, besides of lifting up and down, allows you to orientate the slats. 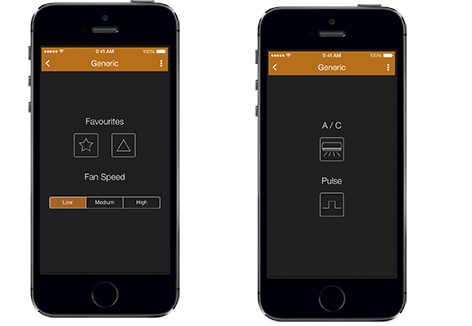 With HouseinHand KNX, it is possible to control any of these functions. All the logic control signals are done by HouseinHand KNX. Velux supplies a complete range of roof windows. HouseinHand KNX is able to control them when connecting its actuators to KNX binary outputs. All the logic control signals are done by HouseinHand KNX. With HouseinHand KNX you will be able to change between the climate modes available in the KNX thermostats. If you prefer so, you can also visualize the current temperature of the house as well as modify the setpoint temperature of each thermostat. You can also create your personalized climate control by adding the necessary widgets for your KNX installation. They will let you monitor and control your HVAC KNX devices including, of course, the IntesisBox gateways for air conditioning. This kind of control is thought so that we can send several predefined values to different group addresses. For instance, in an adjustable light, we can have predefined 25%, 50%, 75% and 100% in the same control. This becomes extensible to adjustable blinds, fans speed or even custom controls. With Generic Buttons, you can enable and disable any kind of actuator or device. Even a door, the Air Conditioner or an automatic irrigation, for example. Beside the HouseinHand KNX environments, you will be able to control the famous KNX scenes pre-programmed by the Home Automation integrator. There are several icons prepared for typical actions such as general turn off, lowering blinds or activating a presence simulator. You just have to choose the right one for the action you have already programmed as a scene in your KNX system, and use the corresponding group address to activate the scene. When you are not at home you might want to check if there is any weather condition, or some other important data, that could cause damage to your installation. With HouseinHand KNX you will be able to check the temperature, humidity, pressure, air quality, power, voltage, current, velocity, wind speed, luminosity level and rain, no matter how far you are. As an example, you could combine some of these viewers on the same page called “Alerts”, or create specific pages for “Weather”, “Security”, etc. 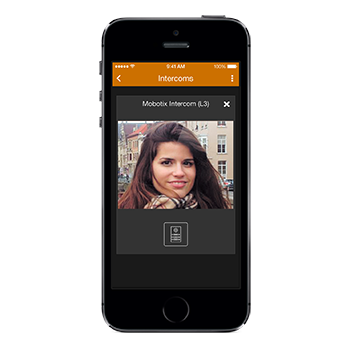 With a Mobotix® T24 intercom system, you can benefit even more! Now, with HouseinHand KNX, you won’t only be able to see who’s ringing your doorbell, but also open it to friendly visitors! HouseinHand KNX also adds support for a generic video intercom system using an IP camera and a relay. Just set up your door communication system, make sure to put the right IP address in your HouseinHand Designer project and, in a few minutes, you’ll be able to control and see what is happening at your door. The newest advantages offered by HouseinHand KNX are not only about TV controlling but also offers the possibility to control other multimedia devices including, but not limited to, music display, iPod music support, and projectors. In order to control these multimedia devices, you’ll just have to configure your Global Caché or IRTrans device and introduce all the necessary parameters into the HouseinHand Designer. Your house in your pocket, your house in your hand! 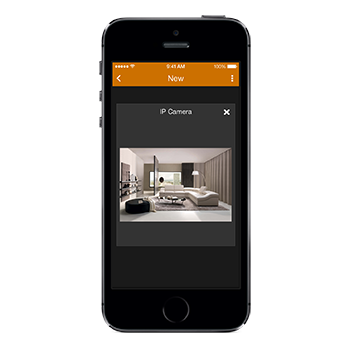 HouseinHand KNX also allows monitoring what is happening at your home using IP Cameras. Axis® and Mobotix® IP cameras are supported. Also, if you have any other IP camera brand, you can always use the Generic IP camera widget, which will let you introduce your camera’s IP address and port, and modify the video stream by entering CGI parameters into the HouseinHand Designer. After doing that, you’ll be able to see what is happening at your place, providing you more security and comfort.